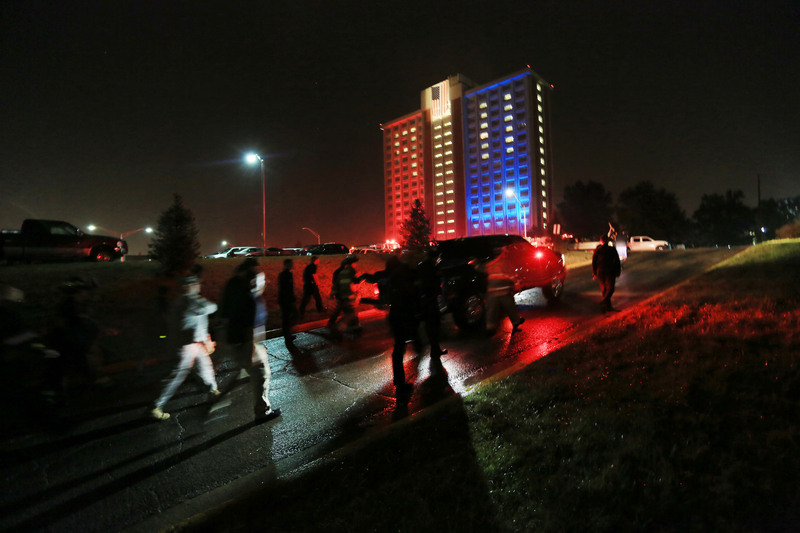 Hundreds of EKU faculty, students, staff and friends turned out on Friday, September 11, 2014 to commemorate the men and women, especially the first responders, who lost their lives in the terrorist attacks on the World Trade Center, the Pentagon and Flight 93 in Pennsylvania. A memorial service was held in the EKU Center for the Arts and two separate stair climbs of Keene Hall. Featured speaker at the service was Dennis Reilly, Chief of the Sunrise Beach Fire Protection District in Sunrise Beach, Missouri. He was a Battalion Chief with the Cherry Hill New Jersey Fire Department and a member of the New Jersey Urban Search & Rescue Task Force 1. Elements of Task Force 1 were in Manhattan by noon on the 11th. The memorial ceremony featured a color guard from the Richmond and Frankfort Fire Departments, bagpiper Jesse Short, of the Kentucky United Pipes and Drums and the national anthem was performed by EKU students Alex and M.J. White. The event was sponsored by the College of Justice & Safety, Housing and the EKU Center for the Arts.